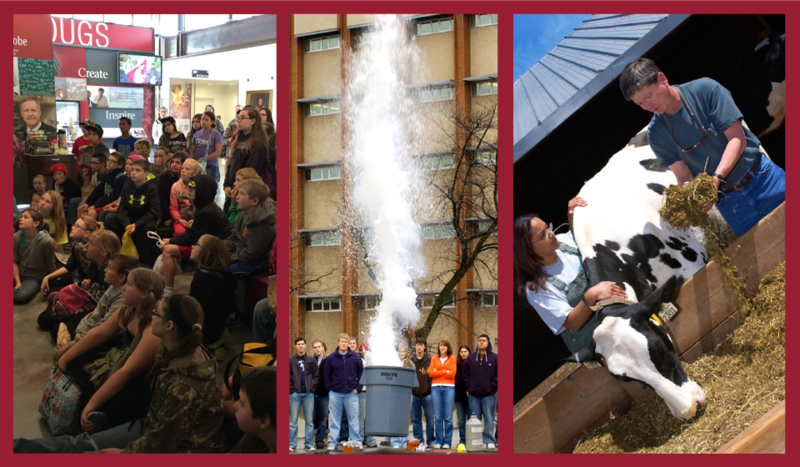 Washington State University is proud to offer a unique opportunity to experience our world-class campus first-hand through our field trips service. As a outstanding institute of post-secondary education, with facilities on the forefront of groundbreaking research, our university is home to many unique departments and distinguished faculty that are eager to share their experience with young minds. We offer youth an opportunity to engage with our faculty, to learn, and to have fun while doing it! Whether they are learning about the laws of the natural world during our EXPLOSIVE physics demonstration or exploring the world of art by touring the Jordan Schnitzer Museum of Art, they are bound to walk away with new found knowledge and an experience they will never forget. Interested in transportation funding for your visit? Check out the Buy-a-Busload-of-Kids-Program from the Jordan Schnitzer Museum of Art! The Buy-a-Busload-of-Kids program offers transportation funding to schools within a 100-mile radius to take field trips to the Jordan Schnitzer Museum of Art. Print – Fill out – Return this form. Submit your online visit request. Receive confirmation of your visit. Bussing arrangements must be made by the requesting agency. Transportation reimbursement arrangements will be made through the Jordan Schnitzer Museum of Art. See the Museum of Art website for more details. Washington State University is proud to offer youth, grades K-8, a unique opportunity to experience our world-class campus first-hand through our field trips service. As a stellar institute of post-secondary education, with facilities on the forefront of groundbreaking research, our university is home to many unique departments and distinguished faculty that are eager to share their experience with young minds. We offer youth an opportunity to engage with our faculty, to learn and to have fun while doing it! Whether they are learning about the laws of the natural world during our EXPLOSIVE physics demonstration or exploring the world of art by touring the Jordan Schnitzer Museum of Art, they are bound to walk away with knew-found knowledge and an experience they will never forget. For a complete list of the activities we offer, please click on the “Activities” link in the navigation panel. To schedule a field trip, please click on the “Register” link to your left. Please keep in mind that we can only facilitate one field trip per day. Please call the Brelsford WSU Visitor Center at 509-335-4636 if you should have any additional questions.